If you’re in the market to buy a boom lift, the process is very similar to buying a car. Even though aerial lifts and boom lifts are used for industrial applications, and automobiles are driven for mostly personal use, the goal is the same. You want to purchase the most reliable, dependable, longest lasting, best performing machine possible. CertifyMeOnline.net, the leader in OSHA aerial lift and scissor lift training, is familiar with all types of aerial lifts, scissor lifts, and boom lifts. Our comprehensive training packages cover important aspects of safe lift operation – but when it comes to purchasing boom lifts and other aerial work platforms (AWPs), you’re usually on your own. But not anymore. The aerial lift experts at CMO have put together a handful of things to consider when purchasing an aerial lift. Let’s review some important considerations when you’re in the market for an aerial lift. 1. Terrain. Some aerial lifts are designed for rough terrain construction sites, while others are made for mostly indoor use. If the ground surface isn’t accounted for, you could end up paying too much for your boom lift or suffer in safety. 2. Load/lifting requirements. Will your boom lift be used to lift a single worker with light equipment? Will it need to lift a big load? Pay attention to your possible purchase’s lift requirements. One other tip: ask to review the manufacturer’s operating manual, and make sure their requirements align your own! 3. Height. Some aerial lifts reach up to 180 feet in the air! However, your boom lift shouldn’t be purchased solely on how high it can reach. Get a general assessment of your typical reach requirements, and purchase accordingly. You might pay way too much for a lift simply because it can extend far beyond your own job site needs. 4. Reliability reviews. Do your research about a boom lift’s performance. Check reviews. Talk to others in your industry who’ve used an aerial lift you’re considering to purchase. Word of mouth is a great way to get the aerial lift you want – the first time! 5. Price. Sounds obvious, but price is a huge factor when buying a boom lift. Sometimes, it’s even the most important factor. 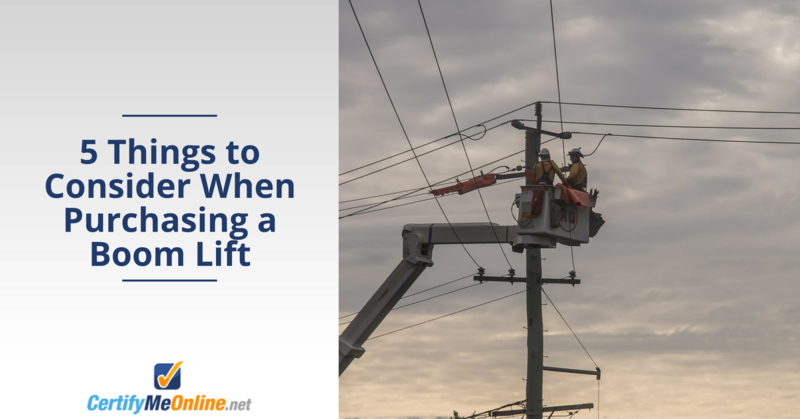 Once you’ve already factored the previous four attributes above, it’s much easier to compare aerial lifts with similar prices. Just like the reliability reviews, a little extra homework and research here goes a long way toward getting the best possible boom lift. From Boom Lift Purchases to Complete OSHA Compliant Training, Call CMO Today! Aerial lift operators aren’t usually involved in the purchase of equipment. However, we think it’s always a good idea for any company to receive operational input from the people actually doing the work. If you’re a boom lift, AWP, or aerial lift operator and your firm is considering purchasing a new lift, talk to your supervisor or someone in purchasing. They’ll appreciate your feedback. And now that you’re aware of certain factors to look for when buying an aerial lift, who knows? Maybe you can be part of the process to purchase new equipment! For the best aerial lift and AWP training, check out CMO’s training courses today. With our streamlined learning content and lifetime support, you and your co-workers will gain the OSHA compliance necessary to meet all state and federal regulations – and also the confidence that comes with knowing the correct, safe way to operate an aerial lift, AWP, or scissor lift! For information about our training content, check out our affordable, OSHA compliant courses today. If you have any questions or would like to speak directly to our OSHA training experts, give us a call at (602) 277-0615. This entry was posted in Aerial Lift Training on June 20, 2018 by admin.